Psychometric theory focuses primarily on tests that are homogeneous, that measure only one attribute of a psychosocial entity. However, the complexity of psychosocial behavior often requires tests that are heterogeneous, that measure more than one attribute. In this presentation, reliability and internal consistency are extended to heterogeneous tests under the rubric of congeneric test theory. The extensions show that reliability and internal consistency have very	similar properties. Reliability and internal consistency are shown to be unique up to a linear transformation. Whereas internal consistency is a lower bound to reliability in the homogeneous case, it is a strict lower bound in the heterogeneous case. Reliability equals internal consistency if and only if the test is homogeneous and true-score equivalent. An analytic argument shows that neither reliability nor internal consistency can detect whether a test is homogeneous or heterogeneous. 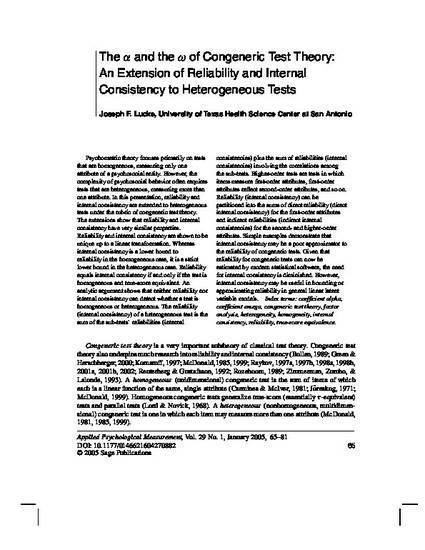 The reliability (internal consistency) of a heterogeneous test is the sum of the sub-tests' reliabilities (internal consistencies) plus the sum of reliabilities (internal consistencies) involving the correlations among the sub-tests. Higher-order tests are tests in which items measure first-order attributes, first-order attributes reflect second-order attributes, and so on. Reliability (internal consistency) can be partitioned into the sums of direct reliability ( direct internal consistency) for the first-order attributes and indirect reliabilities (indirect internal consistencies) for the second- and higher-order attributes. Simple examples demonstrate that internal consistency may be a poor approximator to the reliability	of congeneric tests. Given that reliability for congeneric testscan now be estimated by modern statistical software, the need for	internal consistency is diminished. However, internal consistency may still be useful in bounding or approximating reliability in general linear latent variable models.